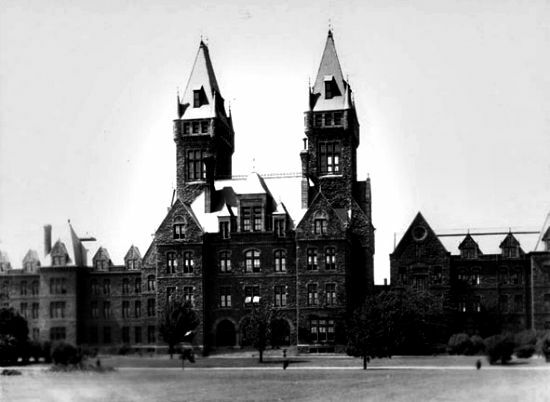 The Buffalo state asylum, or the Richardson Olmsted complex as it was later known, is a brick and sandstone hospital complex built on the design of the Kirkbride plan. Construction began in 1870 and it was one of the first asylums of its size to be built on the kirkbride plan, which was a standard set up of the administration building being in the center, and then all the patient wings stretching out in single lines, which would allow fresh air and sun light into every room. This was a huge advancement from what came before the plan, which was to house people deemed to be of unsound mind in regular prisons. The idea of the asylum was thoughtful enough, but this didn't stop the problems from starting almost straight away. One of the main issues that early asylums had was that people didn't really understand what was a real mental problem, which led to people being sent to places like this for the stupidest of reasons. This led to the asylum becoming very, very overcrowded and because they only received the funding for their standard capacity, not the number of inmates, treatment and services began to heavily suffer. The asylum was closed down in 1974, but in 2013 plans were announced to turn the complex into a hotel and conference center, and these plans are close to completion, with it expecting to be open by the end of 2016. Is Buffalo State Asylum Haunted? I doubt there is an asylum in the country that was open during the 1800's that isn't thought to be haunted, but due to the things that went on in places like this there little wonder as to why. Treatments during its early days were nothing more than experiments and would today be considered torture, with lobotomy's and electric shock treatment being common, its little wonder that some spirits still linger here. As for paranormal activity most of the stories come from thrill seekers who went into the complex when it stood abandoned between 1974 and 2013. One notable thing said by many of the people who have gone inside have claimed that the hospital looks like it was evacuated very quickly, with much of the equipment being left behind and even half eaten meals being left on tables, as if people were rushed out half way through dinner. There is no explanation as to why this would have been though, but non the less it seems to be true. The stories about ghostly activity normally involve sounds, though there have been a few tales of the sighting of apparitions of patients. The sounds mostly seem to include the sounds of suffering, with a frequently reported one being a blood curdling scream coming from the end room of each wing, though no one is ever found upon investigation.